Fifteen villages in Northern Angami-II Assembly constituency under Kohima district took a pledge to conserve and preserve forest and wildlife in their respective villages. 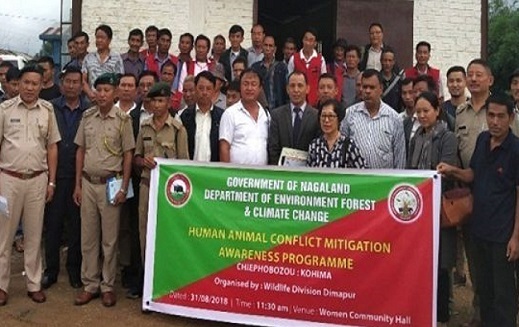 The representatives of the 15 villages took the pledge during a seminar on human-animal conflict mitigation awareness programme, organised by Dimapur wildlife division and sponsored by Union ministry of environment, forest and climate change, in Chiephobozou town recently. Nagaland principal chief conservator of forest and chief wildlife warden, Satya Prakash Tripathi, gave a power-point presentation on the importance and current scenario of forest and wildlife, concept of community reserves, status of community reserves and other government policies existing in the state at the seminar. Highlighting the inter-dependence of communities and environment, Tripathi appealed to the people to protect forest and wildlife. Stating that the students are the future brand ambassadors of conservation, he urged them to carry the mantle of trustee for the environment. Kohima divisional forest officer Rongsenlemla Imchen spoke on the difficult role of forest officers with the growing challenges of wildlife crimes. Imchen urged the public to do away with blame game and take responsibility at the individual level in conserving and preserving wildlife and forests. Additional advocate general of Gauhati High Court, Kohima Bench, Kekhriengulie Theünuo, lauded the efforts of the wildlife wing of the forest department and assured full cooperation towards any conservation projects in the near future. Theünuo informed the participants on how social media could be used to their benefit to claim compensation during human-animal conflict losses. He also appealed everyone to join hands in combating illegal wildlife trade and to look beyond one’s boundaries of responsibility to maintain the ecological balance for sustained supply of water and fresh air for future generations.